Voice search was introduced by Google in 2007. Now, voice search has been revolutionised with the likes of Siri, Alexa, and Google Home and is certainly not a fad. In 2017, the Google assistant was available on over 400 million devices. 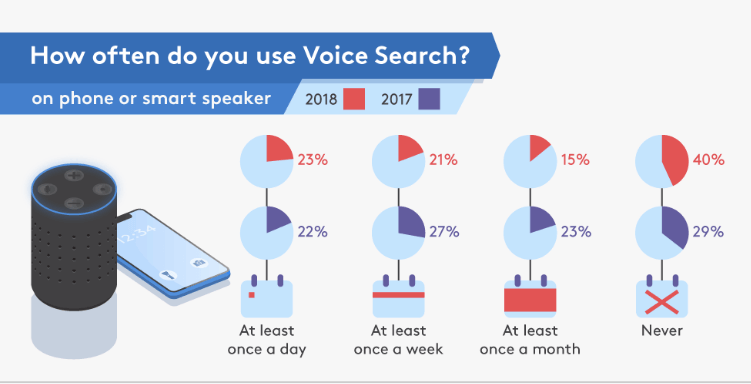 And by 2020, it has been claimed that 50% of all searches will likely be carried out via voice. The study which surveyed over 2000 people found that voice search was in decline with users decreasing trust in voice assistants. So now, do we think voice search a fad? Just like we have given up those large fold-out maps and pulling over to ask for directions, we have now adapted to the convenience of speaking to our device instead of tapping it. “Tonight, Lasagne on the menu, do you want me to set the cooker to 200 degrees and cook it for you too? Google again has struck with marketing genius with their personal assistant. Not only have they named their product to be a household item (‘Google Home’), but each time you use it, you repeat their brand! Marketing Interest in Voice search has exploded over the last couple of years. 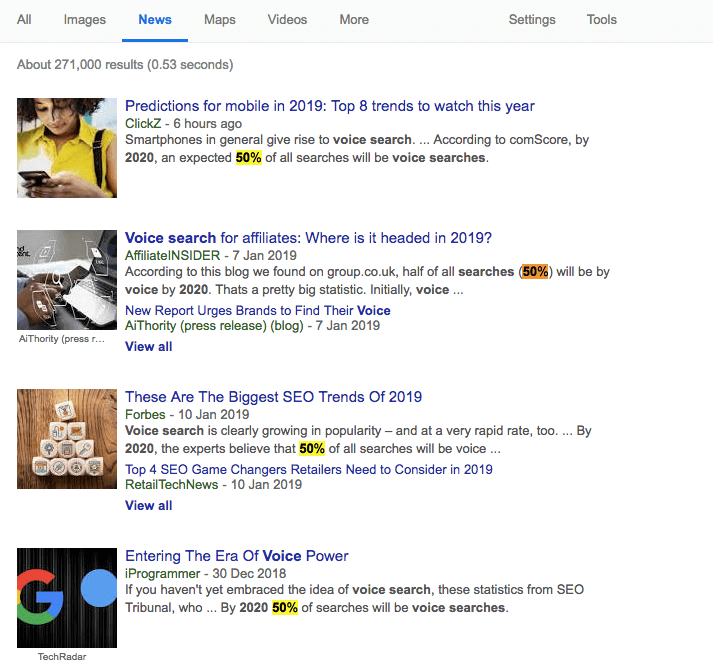 And to no surprise that it made our 2019 SEO trends. In fact, recent research by Geomarketing revealed that 65 per cent of people who own an Amazon Echo or Google Home can’t imagine to going back to the days before they had a smart speaker. With statistics like that, we can’t just be ignorant to voice search marketing and say it’s a fad. We need to embrace the technology and the online search behaviour shift. 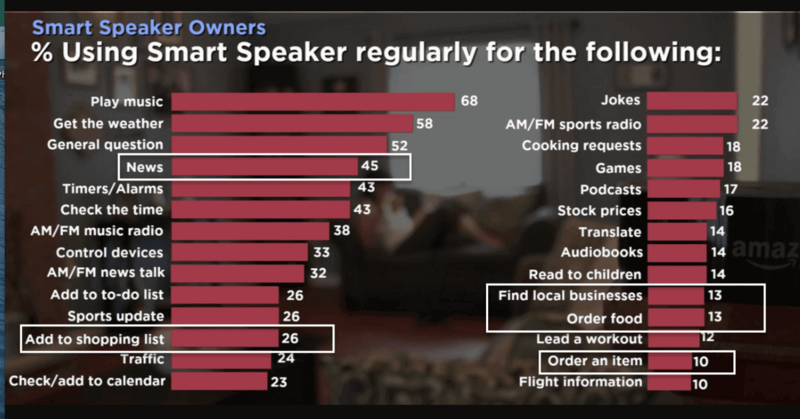 The Edison research, as shown above, revealed the most common ways people use voice search. Not surprisingly the majority of people surveyed used smart speakers for playing music. Apart from the reduction in ad revenue, traditional news organisations are facing difficulties to be relevant in the digital age. To add to the problem, fake news is contributing to the fall in media trust. And with worrying 2018 statistics from sciencemag.org finding that 70% of people are more likely to share a fake news story. This leads us to believe that people cannot distinguish the difference between that of a real news story. 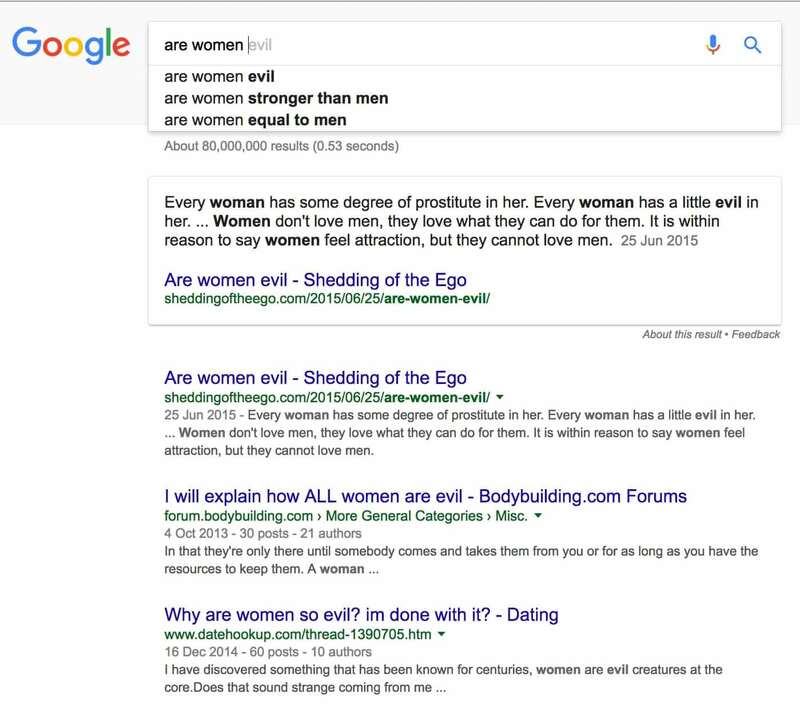 Shown above is an autocomplete and featured snippet for “are women evil” taken from a completely biased blog on masculinity called “sheddingoftheego”. Same was found for when a person asked the Google Home “are jews evil” so much so that Google rightly removed these results manually. Google processes trillions of searches every year, and still, 15% of those queries never been seen by Google before, it would be impossible to continue to remove these types of results manually. That is why it has recently invested in own AI fact checking search engine. This undoubtedly signals the future direction that Google is taking with Voice search. 45% of people who own personal assistants using these to check the news. Therefore as an online news organisation need to adapt and get on board with Google’s latest speakable markup initiative. This new markup and schema is aimed at bringing more news content to the Google Assistant and Google Home devices and sits a massive opportunity for publishers to take advantage of the ever trending voice search. Not only that, podcasts can now be marked up and their content can be shown as results on the web. 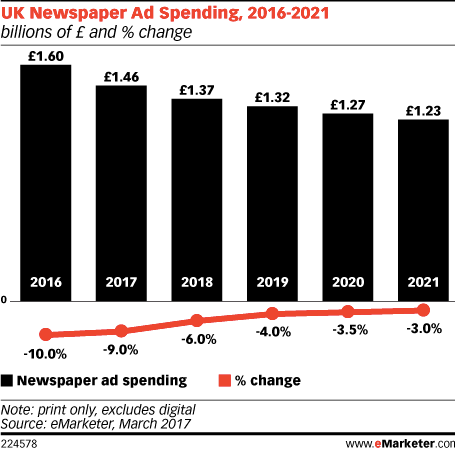 Despite this shift of behaviour for people to hear instead of reading their daily news updates, research carried out by the Reuters Institute found that around a quarter in the UK (23%) and nearly one in ten in the US (7%) could not remember the brand that produced their daily news update. So is this voice search traffic really worth it? And where’s the Commercial Value from Voice Search? With 94% of all smart speakers in use either a Google Home or an Alexa, you can be sure that voice search commercialism was always on their agenda. According to the Global web index, 56% of online grocery shoppers use or plan to use voice-controlled smart assistant/speaker. It’s only time that the built-in feature to add items to your shopping list with Google home connects up with your local supermarket. And with mobile voice-related search being 3 times more likely to be local-based than text, there is a massive local commercial opportunity for small businesses and voice search. 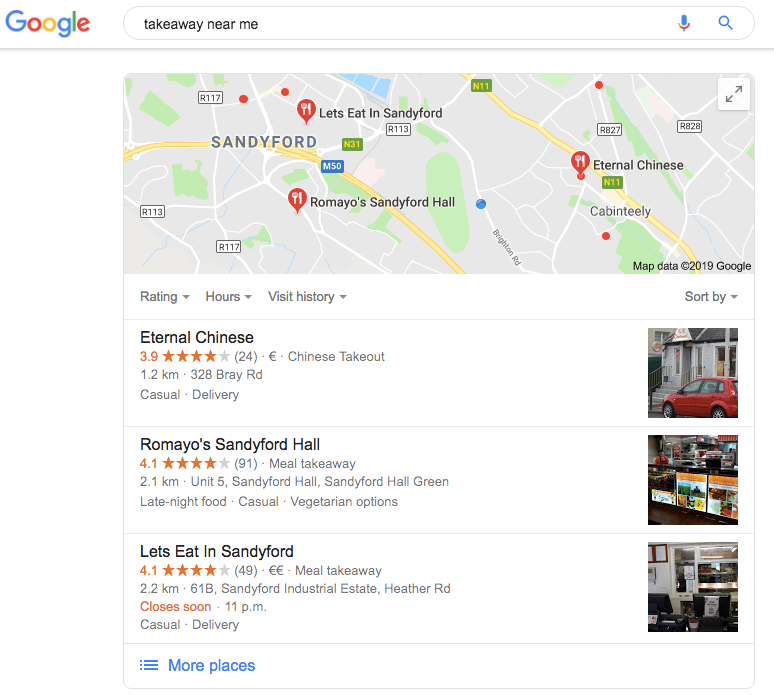 From my location, the results that my Google Home gave me were takeaways near me that appeared in the local pack (shown above). Optimising for local intent based search is critical when it comes to voice search SEO. As we know with online marketing, it’s not always just about the bottom of the funnel, Social Media Today found that 50% of people are now using voice search when researching products. And Unlike traditional text-based search voice search only provides one answer. Brand’s can really take advantage of optimising for voice search and being the single answer to their customer’s query. Voice search may actually not be as much as a fad as we first. Researching and optimising for your customers questions should be top of your marketing and SEO to do list for 2019. Otherwise, you run the risk of your competitors being the answer to your customer’s questions.